Ref No Grave or Memorial / Rhif cyfeirnod bedd: Behind the church, down the steps and on the left. On the 13th September 1920 aged 31 years at 99, Cromwell Road, South Kensington from Breast, bone & lung Cancer. 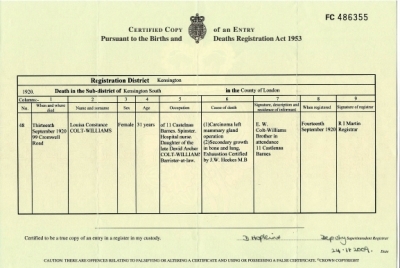 Louisa Constance Colt-Williams was born, possibly at 123, Boughton, Chester in 1889 (Chester Vol. 8a Page 385),and she first appears on the 1891 census living at that address, age 2. Her parents, David Archer Vaughan and Laura Louisa Lilie Colt-Williams (nee Vernon) had married in the December Quarter of 1884 in Kensington, London. David’s parents were David Williams and his mother was Martha Elizabeth Flora Colt and they married in the Parish of St. George, Bloomsbury, Middlesex on the 16th July 1845, he was a Clerk in Orders, and both “of full age.” Martha’s father was a Baronet, Sir Edward Vaughan. Colt. 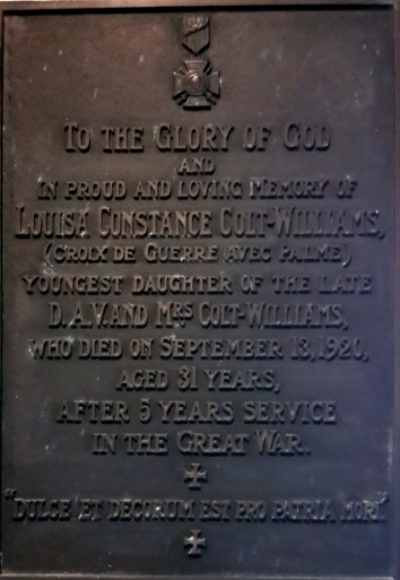 There are many Colt-Williams family members in the Nannerch Churchyard, including Louisa, as that is where her grandfather, David Williams,was a Vicar. The 1891 census shows Louisa, age 2 as the second daughter of the couple, her sister Emma Laura, (** I think this is an Enumerator’s error and should be Edith Laura), was age 4. There were 2 sons, the eldest was Edward W.D., 5 and George A., 11 months old, all of whom had been born in Chester. They were all living at the home of Louisa’s Grandfather Henry J. Vernon, 75, a widower and Clerk in Holy orders, who had been born in Bilton, Wiltshire. Louisa’s mother Laura, 39 had been born in London, David, her father, age 41 and a Barrister had been born in Nannerch, Flintshire. By the 1901 census the family had moved to Manley Hall, Manley, Chester. Head of the household was David, 51 a Barrister at Law, mother Laura was now 49 and her birth place was given as Clapham, London. There were only the 2 daughter at home, sadly baby George had died in 1903 age 3 (Chester Vol. 8a, page 289), Edward, 15 was a visitor in Croydon at the home of Samuel J. Bardell or Rendell?? on London Road, Croydon. Samuel was a member of the London Stock Exchange. 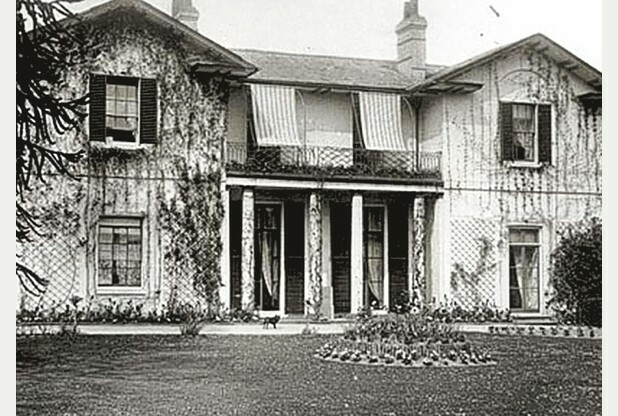 Louisa and Edith were still at Manley Hall on the 1911 census, which had 20 rooms. David Archer Vaughan Colt-Williams was now 61 and tells us that he had been married 26 years, he was still a Barrister at Law. His wife Laura L.L. Colt-Williams, 59 tells us that 4 children had been born, but 1 had died. Edith Laura was 24, and single, Louisa Constance, 22 also single. There were 4 servants in the household. Edward, Louisa’s brother on the 1911 census was living at 3, Bridge Avenue Mansions, Hammersmith, W. London with 6 rooms. He was now 25 years old, married to Natalie Beatrice (nee Grant) and he was a Barrister. The couple were blessed with a baby daughter Eileen Natalie, 4 months old. They also had a servant. They had married in Kensington (Vol 1a, Page 258) in the December quarter of 1909. David Archer Vaughan Colt-Williams was to die in March of 1914, just after they moved into the Old Rectory at Crawley, his wife Laura was to die in the June Quarter of 1919. In an article in the Crawley News, http://www.crawleynews.co.uk/world-war-heroic-nurse-crawley-awarded-french/story-22013481-detail/story.html#HfHS0m6khxe55zz0.99WAR Louisa was said to have wanted to contribute towards the war effort and signed up as a Voluntary Aid Detachment (VAD) and by February 1915 she had completed her training in home nursing and in an article in a newspaper at the time was one of the VAD’s who passed her exams in December 1914. She was based at Crawley Hospital, where Asda now stands. However Louisa’s medal card tells us that her first Theatre was 10, which must have been France and her date of entry therein was October 1915. As can be seen she was in the French Red Cross as a Nurse. I have read where British Nurses offered themselves to the British Red Cross, but they were rebuffed and the French snapped them up to work in France. Not to be confused with a Louisa C. Williams, who was in the VAD and signed as Cicely. Dear Sir/Madam, I am researching an Englishwoman who was in the French Red cross and was captured with two other Nursing Sisters, who were not British, by the Germans and was among French Medical Officers also captured and taken to the 261st Field Lazarette at Beaurieux. The lady in question was Louise Constance Colt-Williams, a Nurse who gave invaluable assistance to 3 British Officers who were also captured and from the R.A.M.C.attached 25th Brigade, R.F.A. at Maizy. Louise was repatriated before the examiner T.BYARD, Captain, wrote the report, on 8th November at 17, Mancester Square. The report was from Captain W.A. Rees, age 35, address:- Portroller House, Stornaway, who was captured 28th May 1918 at Maizy and not wounded. This was from the National Archives WO/161/97/65. I would like to know how to find out about these remarkable women who joined the French Red Cross in WW1. Any help would be greatly appreciated. Thanks in advance. No 37 Casualty Clearing Station was at Mont-Notre-Dame from 20th May 1918 to 10th June 1918. (see http://www.vlib.us/medical/CCS/ccs.htm ) for list of Casualty Clearing Stations. “On the 27th May 1918 the British IX Corps front was allocated a sector of front north of the River Aisne at the eastern end of the Ladies Road, better known by its French name of Chemin des Dames. CCs 37 was allocated a number of huts on the site of a large and sophisticated French Hospital, l’Hospital d’Origine d’Evacuation 32 (HOE 32) close to the village of Mont Notre Dame. It’s operational life on the Western Front was destined to be a brief hiatus between its arrival from Italy and became operational on the 28th April 1918 and its capture on 28th May 1918.” Taken from The Western Front Association “Stand To! No 86. I wrote to the Army Forum on 1914-1918 invision, they were so helpful, as usual, and Maurice.Johnson, on the 5th September 2009, told me about a letter, from Louisa, a copy of which, he kindly sent to me. I cannot get it to transfer to the website, for reasons unknown, but I an adding my transcribed copy of the typed letter, which I believe to be a transcription of a hand written letter from Louisa. I have only just come back from Germany where I have been a prisoner for 4 and 1/2 months, and am writing immediately to give you what news I can of your Son Capt. Hewetson who was brought to our Ambulance as a prisoner, seriously wounded in the leg, we had to amputate immediately and he was doing well, then we were all sent to another ambulance about 3 weeks afterwards and had to leave all our wounded in charge of the German Doctors and fortunately English Orderlies. About 3 weeks after that I saw one of the orderlies who told me that your son had never done so well after the English Surgeon and I, who was the only English Nurse there, had left and forgive me for having to tell you such painful news, but it appears he died of Septic Pneumonia about the end of June or the beginning of July. The orderly told me that the German Doctors did everything possible for him but he had gas-gangrene and it was evidently too much for him. He is buried at Beaurieux where he died. It is a little village where my ambulance was, between the Aisne and the Graonnelle Plateau. I was working there with the French when the attack came and we were all taken as an Ambulance and your son was brought in on May 28th. The village has now been retaken by the French, as I know the spot so well I can tell you exactly where it is, and after the War is over you will be able to come and see it I hope. It may comfort you to know that he was operated on by an English Surgeon, Major Handfield-Jones, who was taken at Beaurieux the same day as I was and with whom I worked for 6 weeks, he was therefore in our care for three weeks but it appears that he lost all heart after we left. Had I only been there when he died I could have saved some of his things for you, as it is I can only offer you my heartfelt sympathy in your great sorrow. You must have suffered so from anxiety when you knew he was missing. I who have been a prisoner myself know what my own people suffered. As far as I could see the Germans treated the enemy wounded like their own, every man who died was buried by the Chaplaine (German) just as if he had died in our own lines and crosses were put over all their graves. They were perfectly correct in their conduct to us. There were only three Nurses, two French girls and myself, and we never had any bother or insult. They certainly respect the Red Cross if nothing else. We were kept at the Front for two months and in Germany for 2 ½ months, we could never understand that, as they ought to have sent us back at once, but we were well treated all through. I must close now, if there is anything else you wish to know and which I can tell you, will you write to me at this address, you will forgive me for having written you such painful news, but I knew I could give you details that no one else could. The soldier in question Captain Richard John Philip Hewetson, was the only son of Rev. W. Hewetson, M.A. and Mrs Hewetson of St. Cuthbert’s Rectory, Bedford,and had served from August 1914, previously being wounded at Loos in 1915. As can be seen by the letter, Louisa was still in Paris in October 1918, probably shortly after she was released from the Prisoner of War camp in Germany. Louisa had been a very brave Nurse and had to leave, under duress, her patients and was imprisoned as can be seen from her letter above, she therefore, as well as the stress of the bombardments and the daily grind of looking after her charges, had to bear the indignity and stress of imprisonment which after all must have had a detrimental effect on her health. She was to succumb and suffer from Breast Cancer which then spread to both lung and bone cancer. Bless her, I really wish I could have met her, she was an inspiration to others. She died age 31 years of age, 2 years after being released from imprisonment. I tried to get her mentioned on the Commonwealth War Graves Commission database, but this was refused. I n their adjudication, the National Army Museum (Ref: WGA 955 – CWGC Ref: ARMY 4073) dated 5th January 2017 they said that she did not qualify for commemoration due to the fact there are no records to say that she was “under contract serving with the Fighting Services” at the time of death. 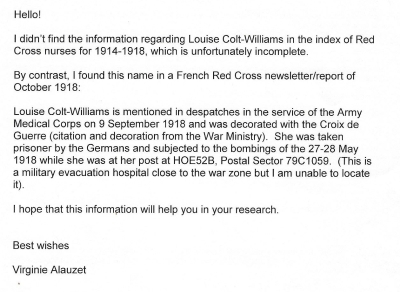 The undated newspaper report (which I had sent to them) says she was serving in the French Red Cross when she was captured by the German army in 1918, it does not mention if she remained in service after her release either in the VAD or British Red Cross Society at the time of her death. Louisa’s service record doesn’t survive and there is no entry in the “Soldier’s Effects Register for her. An undischarged soldier or VAD nurse would normally be recorded in this register if they died in service. Although the Memorial says that Nurse Colt-Williams died in 1921 after “5 years service in the Great War” it doesn’t confirm dates of service. 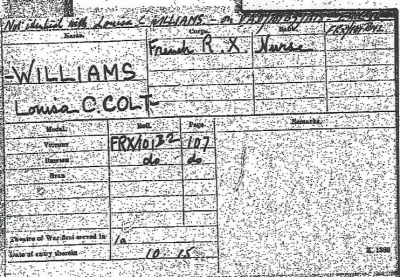 Unfortunately, it goes on, there is no official evidence that Nurse Colt-Williams was either in the VAD or other eligible civilian at the time of her death. The Commonwealth War Graves Commission gave 2 websites that the National Army Museum Research had used:- http://1914-1918.invisionzone.com/forums/index.php?/topic/132951-captured-at-beaurieux-28th-may-1918/ , which was my own research questions and Crawley Observer 27th April 12014 http://www.crawleyobserver.co.uk/news/the-woman-who-went-to-war-1-6017007. They also used CWGC Definition of a War Grave memo dated 23rd Feb 1943. However, Louisa’s service was recognised by the French Government as can be seen by the letters above, but when this was awarded to her and where, I do not know. She was awarded the Criox de Querre, Avec Palme. I visited Nannerch Church and found her grave and the Plaque that is hanging on the wall in the church before and left of the altar. See both below.